Single and 2-storey railway station. Coursers, random rubble, brick, timber, cast-iron, grey slate roofs. S range has 2- and 4-pane sash and case windows with chamfered margins, decorative bargeboards at E and W gables, cut-back eaves at N and S, cast-iron rainwater goods. 26 November 1997: The Scotsman reports that Railtrack plans to demolish the existing structures, and replace them with modern shelters. This follows an earlier demolition application some 15 years ago. Local Councillors and the local traders' association are against the plans. The Dundee Evening Telegraph similarly reports on the story. December 1997: The Angus Railway Group comes out against the plans. January 1998: SCT objects to the demolition application. 2 January 1998: The Times reports that the Railway Heritage Trust has offered grant aid if a medium to long-term tenant can be found. 21 January 1998: The Dundee Courier reports that almost 350 organisations and individuals have objected to the proposed demolition. 28 March 1998: Press reports note that Councillors are likely to refuse permission to demolish. April 1998: Permission to demolish is refused. 18 June 1998: The Dundee Courier and Advertiser reports on the station's inclusion in the Buildings at Risk Bulletin. Railtrack has been ordered to carry out repairs, but is appealing. 27 June 1998: The Broughty Ferry Guide reports that the local Councillor has backed the campaign to save the station. 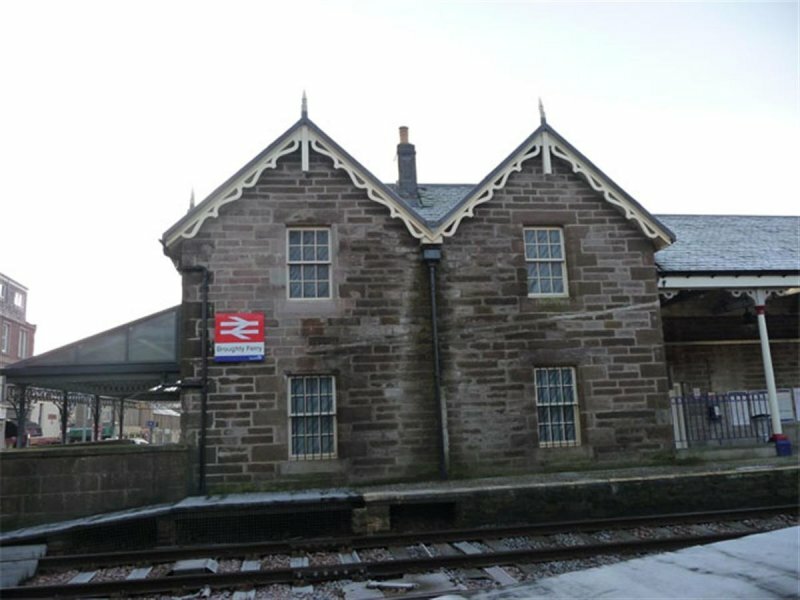 The Council has offered to fund a structural survey of the buildings, dependent on the permission of Railtrack. June 2000: Permission is granted for repair works to the station buildings. 17 January 2001: The Dundee Courier reports that phase 1 of repair works totalling £700,000 is to commence shortly. Roofs and stonework will be repaired, access to platforms improved, and entrances and underpasses glazed. The signal box and footbridge will be dismantled and stored, for re-erection later. 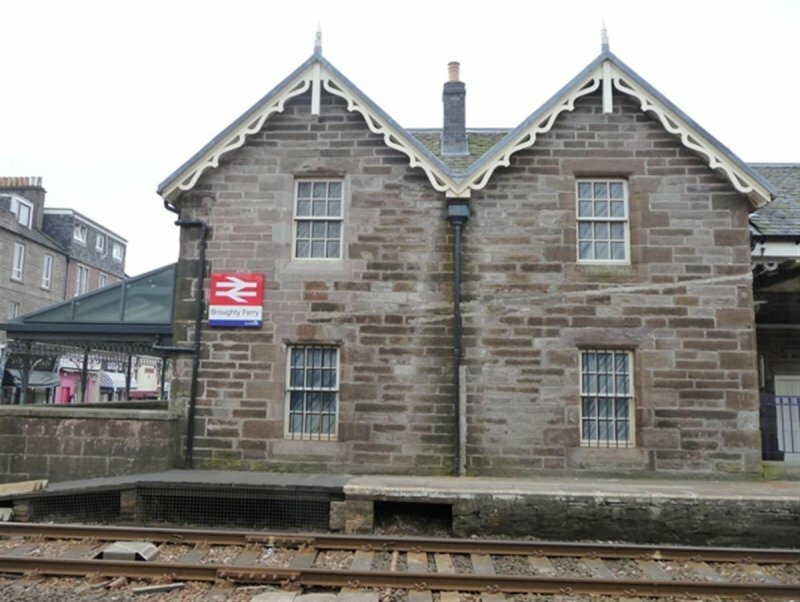 Phase 2 will see repairs to the stone buildings of the southern platform, including the stationmaster's house. 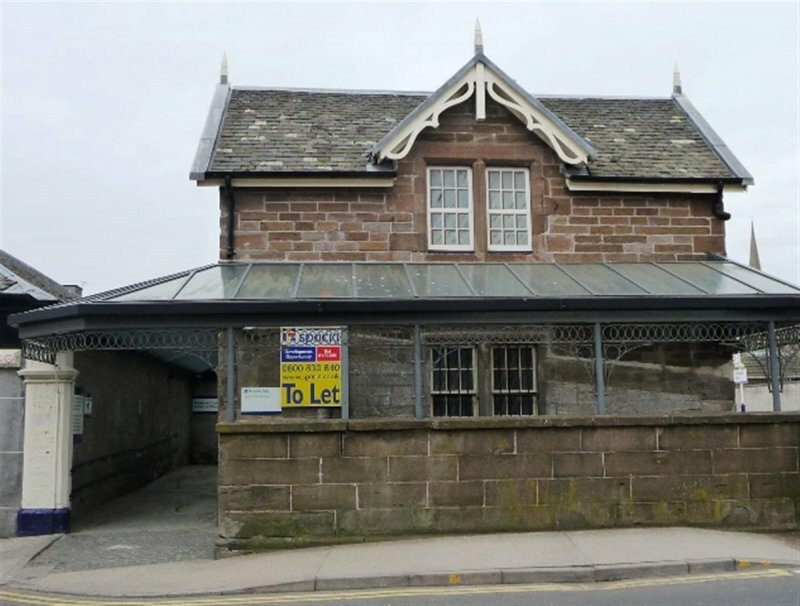 22 March 2002: The Dundee Courier reports on plans to develop the stationmaster's house, waiting room, and other buildings into a restaurant. The overbridge and signal box would also be incorporated. Access to the platforms will be guaranteed to ensure the station remains operational. Developers charged with repairing the structures are currently in discussions with 5 potential end-users. Broughty Ferry Community Council is enthusiastic about the plans. 21 March 2003: The Dundee Courier reports that plans for the restaurant have been lodged with the Council. May 2003: Local planners report that the restaurant plan continues. SCT understands that the waiting room and station master's house have been consolidated, and the bridge and signal box removed for relocation. The platform awning has been returned to its original pitch and will cover the restaurant. April 2004: Historic Scotland reports that restoration works are complete. Set to SAVED. January 2009: External inspection reveals that the station building is now vacant, but in good condition. Moved back to At Risk from Saved. October 2009: The Courier and Advertiser (Dundee Ed) reports that plans are believed to be under preparation for submission to the planning authorities by Network Rail, although the planned use of the building has not been divulged as yet. 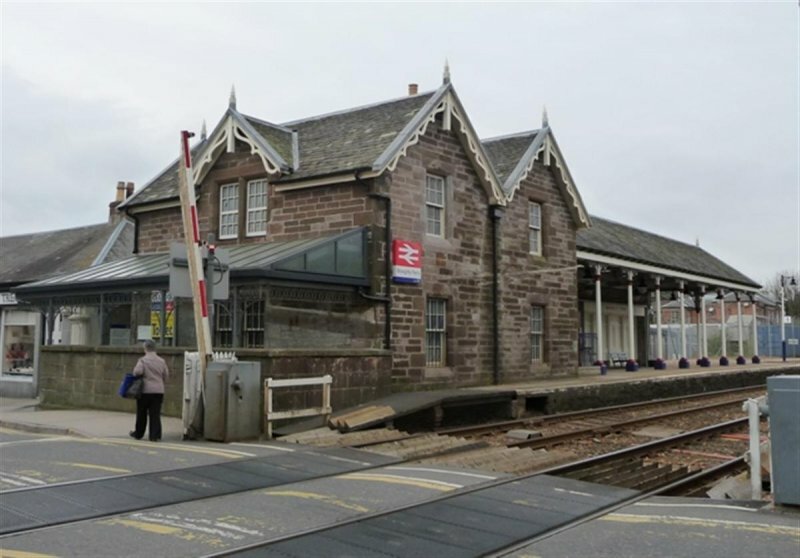 The article notes that a letter from Dundee Citys director of economic development to the Broughty Ferry Community Council planning secretary, advised a meeting took place between the Council and Network Rail in August to discuss the plans. January 2010: The Courier & Advertiser reports that plans for conversion and re-use have been approved. April 2010: External inspection finds the building remains disused though the platforms are in use. The windows remain boarded over. Otherwise, it appears to be in good condition. Change of Use and Listed Building Consent for the former Station Buildings to Form Restaurant and Extension Incorporating Re-Erection of Signal Box was approved, with conditions, Jan & Feb 2010 ref: 09/00677/FULL & 09/00678/LBC. It is currently being advertised for lease. March 2012: A member of the public advises that the building has been getting renovated for the past year or so in relation to the planning application. Pizza Express have reportedly signed the lease and plan to open when renovations are completed this year. Moved to Restoration in Progress. 26 March 2013: Local planners confirm the station building has been refurbished as a restaurant. A tenant business occupier is being sought. Condition moved to Good and Risk to Minimal. 13 May 2016: External inspection confirms external works have been completed but remains disused. The completion of internal works is understood to be awaiting the tenancy being agreed. James Malcolm, PARISH OF MONIFIETH (1910), p 224; plan of subway in possession of Mr Neale Elder, 9 Kinnaird Bank, Perth (copy in DARC); John Perkins, STEAM TRAINS TO DUNDEE (1975); information ex British Rail from enquiry into the future of the level crossing gates, 1989; DUNDEE COURIER. 23 October 1991.